I am a frequent shopper at Goodwill. It is the perfect place to find things to alter and you all know how I love to alter. This little jar has been at my local Goodwill for several weeks. Each time I walk by, I want to buy it, but I never know what to do with it. I finally decided to buy two of them to try a painting technique I wanted to use on larger jars. That experiment did not go so well. Let’s just say, this little jar’s friend will spend his days in the garbage dump. 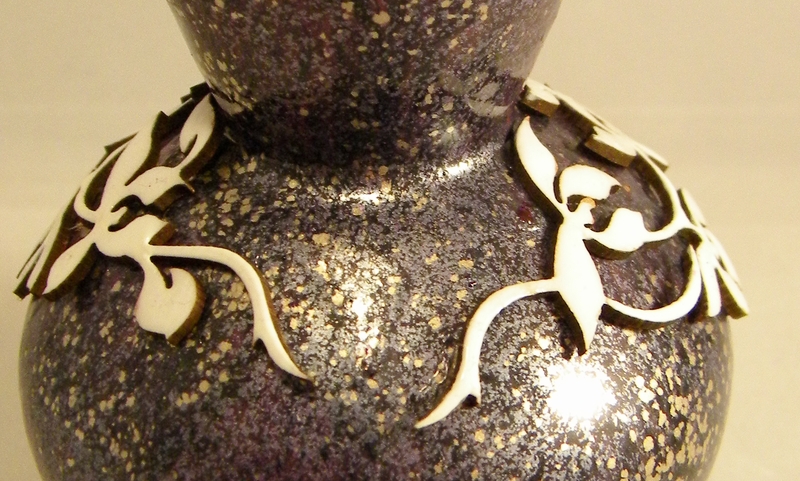 I was totally frustrated when my husband suggested enameling the jar. Thinking the jar would shatter under the intense heat, I said no, but then decided to try it anyway. I figured the worse that could happen would be a mess to clean up and a trip to the ER. First, I wrapped a bit of Tissue Tape by Tim Holtz (masking tape would work as well) around the lip of the vase to mark off an area and then coated it liberally with Piccolo Enamel Powder Adhesive and then with a layer of 24K Gold Enamel Powder. 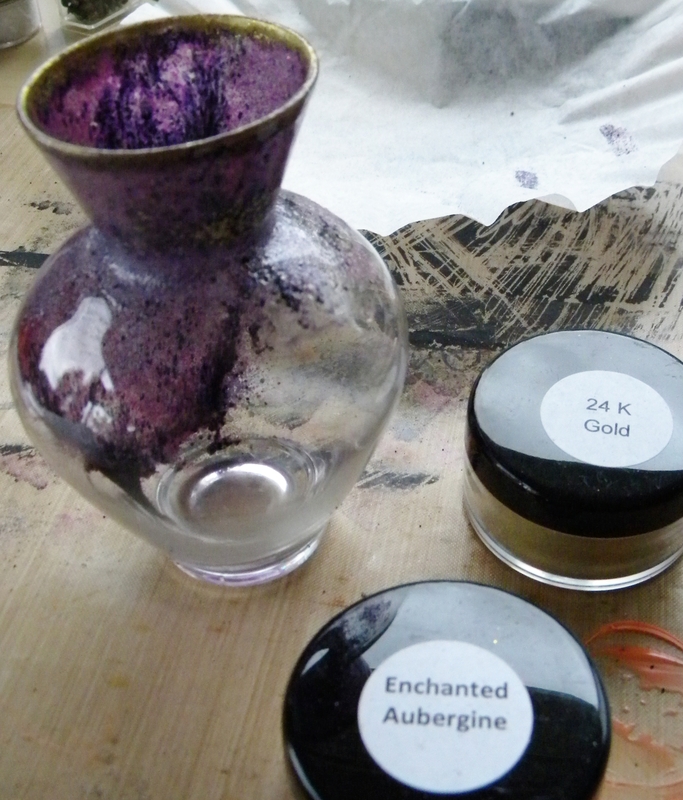 The glass didn’t break, so I kept going — coating the entire jar with Enchanted Aubergine Enamel Powder. This is the point I remembered to take a photo … you can see it was just a clear jar. I have about 1/3 of it coated at this point. I went very slowly — doing a section and then allowing it to cool completely before doing the next section. I used scissors to hold it after a while, because the entire jar heats up each time you heat a small space. And this is how it looked when it was done. 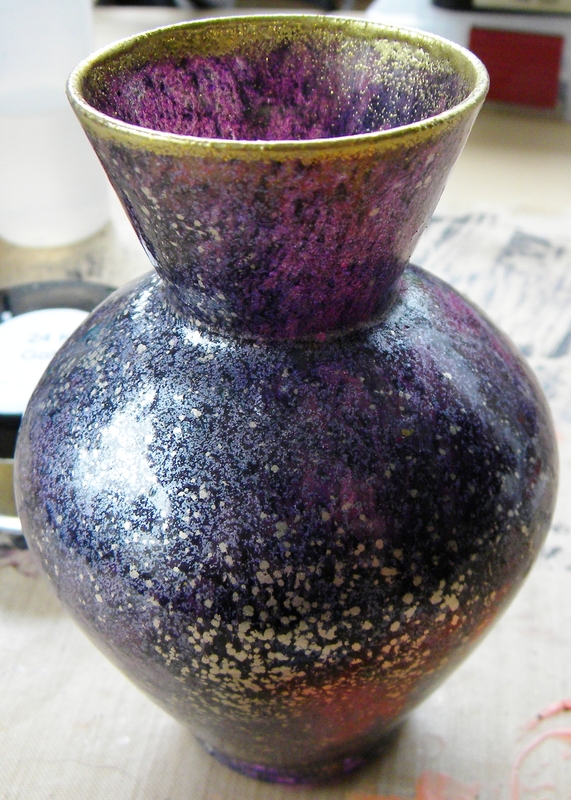 I decided to redo a bit of the gold along the top, since I wrecked some of it trying to hang onto the vase. 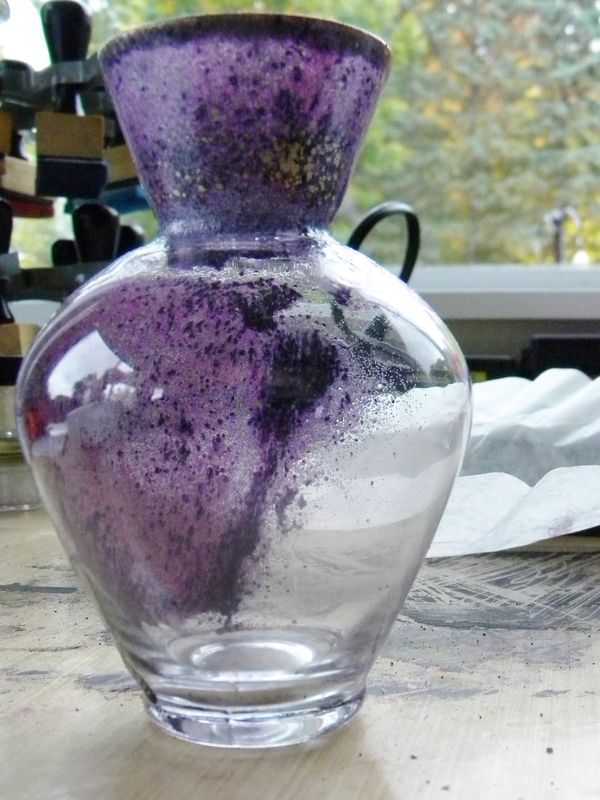 I love how the different-sized particles stuck to certain areas of the vase. It makes it very interesting. Then, I decided to add some Piccolo decor to the top. I coated them with Cool-Set Enamel Gel in white. 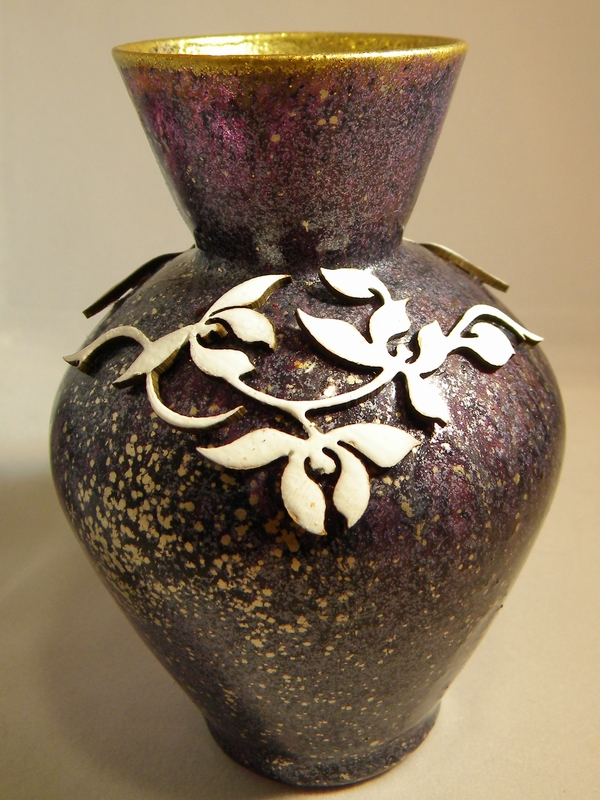 Because they are cut very intricately with a laser, I was able to mold the compressed chipboard Piccolo around the vase. Here is a closer look at the Piccolo pieces. (These are from Little Decor Set 1). 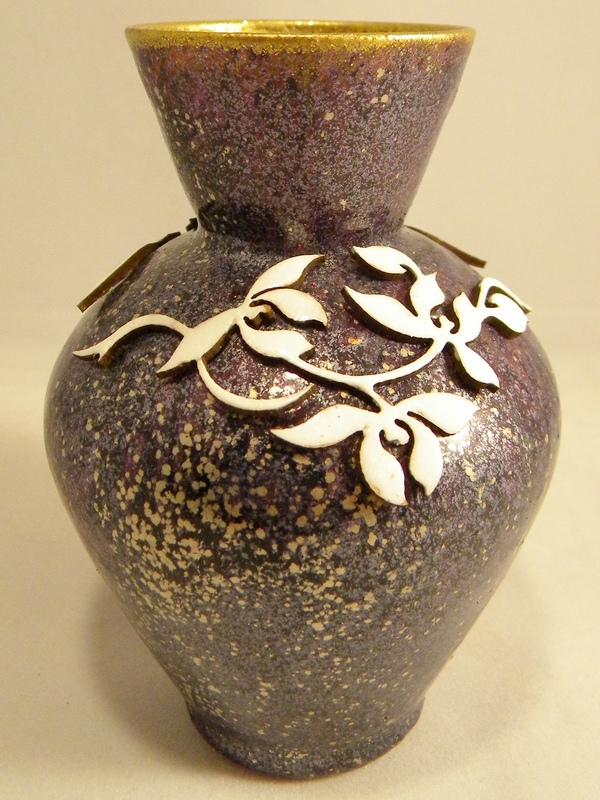 And here is my finished vase. My husband said it reminded him of art glass and that’s the biggest compliment I can get! Visit my blog to see more creations I have made using Globecraft & Piccolo. This is such a cool project! Helpful to know the Piccolo Enamel Powders will stick to just about any surface that will take heat! Wow, the enamel powders really make this look artsy and it looks so easy to do! Love it! Looks awesome, love how the powders react differently around the glass.